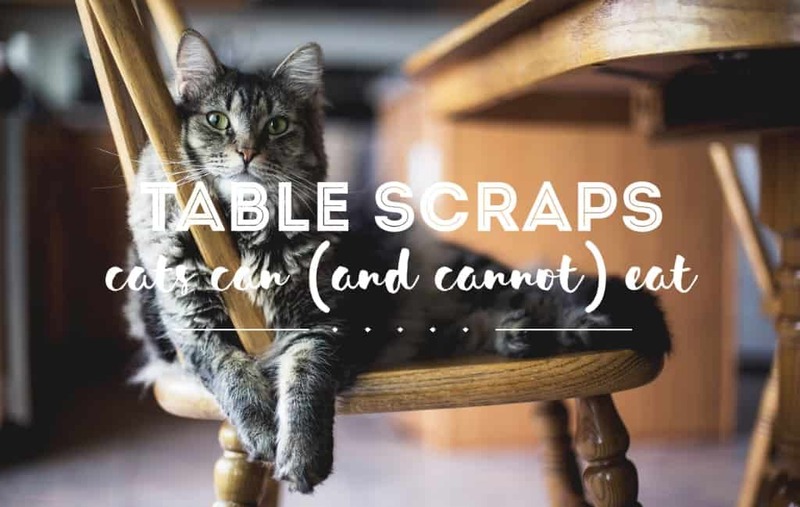 Can cats eat table scraps? We tend to imagine that a bowl of kibbles isn’t much fun. 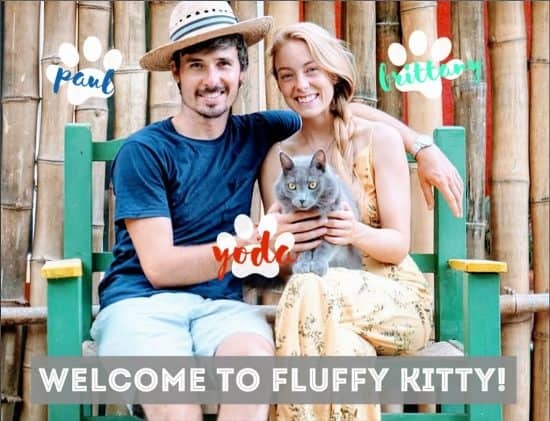 Therefore, particularly on special occasions – eating holidays – we want to give Kitty something special. Don’t bother with sweets – cats can’t taste sweetness. Kitty’s kibbles may seem boring, but what we like and what they need are usually not the same. Your cat has a small stomach and anything that she puts into it takes up space that is better relegated to the stuff she actually requires. A nibble or two of “people food” can be okay, but you need to be aware that some of the things you relish, can send Kitty to the vet. Final Thoughts: Can Cats Eat Table Scraps? These and other related veggies like leeks contain N-propyl disulphide which destroy red blood cells causing Heinz Body Anemia. If you give scraps of meat to your cat, just first make sure it wasn’t cooked with onions, garlic, or seasonings. These veggies are related to the nightshade plant and contain Glycoalkaloid Solanine. When cats eat these they can develop severe lower GI symptoms. These are particularly toxic to dogs but have not been thoroughly studied in felines. We suggest that taking a chance isn’t worth it. Take a look at what fruits cats can eat. Theobromine, found in chocolate, is toxic and can be fatal to both cats and dogs. (If you think Kitty or Barker have raided the candy stash, check out this article). Additionally, avoid giving your cat a piece of the Christmas cake. A little lick won’t hurt, but as cats cannot taste sugar, it’s better to avoid any Christmas cakes or cookies. Many cats are lactose intolerant. Others love the stuff. If it doesn’t give your cat gas or cause him to vomit, you can give 1 percent milk as an occasional treat. About a tablespoon is the right amount. Table scraps cats can eat are the heart, gizzard, and liver of the turkey. Cook them without onions and garlic. When the giblets are done, cut them up in small pieces and refrigerate for use later as high-protein treats. Can cats eat table scraps if it’s grilled salmon? It all depends upon how it’s seasoned. Even a little garlic and onion salt is verboten. 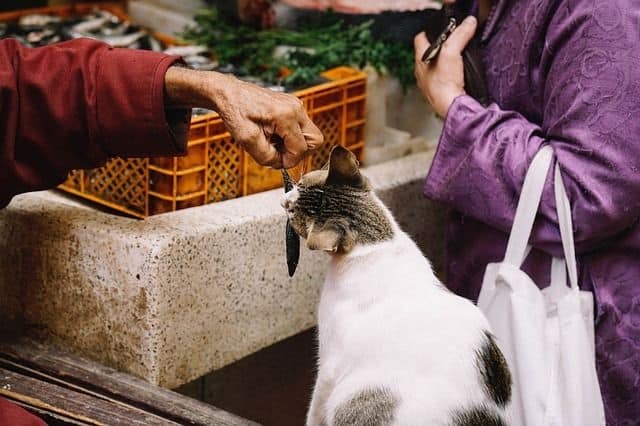 A tiny bite of boiled or poached salmon is fine as long as you remember that fish doesn’t do much for Kitty’s nutrition. Raw fish is not a good option. An enzyme in raw fish destroys thiamine – an essential feline nutrient. 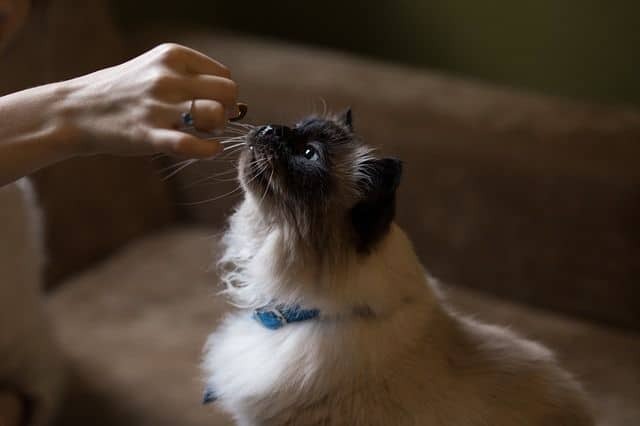 On the subject of fish – you may think canned tuna is the ultimate kitty treat. But it’s not. Tuna may contain Omega 3 fatty acids, but it has little else in nutritional value. Give your cat supplemental fish oil and leave the tummy space for her premium cat food. Tiny bits of table scraps (as detailed here) won’t hurt your cat. Previous Post Why Do Cat Scratches Itch and Swell?